Singapore debt market deepens with Asian Bond Grant Scheme — Bondlinc: Digitalizing Bond Trading. Since its launch by the Monetary Authority of Singapore (MAS) in January 2017, it has facilitated many landmark bond transactions from the region, enlarging the Singapore debt market in the process. The 2018 corporate debt market report released by the MAS on Tuesday notes that first-time issuances nearly tripled to S$27.4 billion last year, up from S$10.2 billion in 2016. The number of first-time issuers also went up, from 37 in 2016 to 63 in last year, reversing the declining trend of the past few years. Many of these first-time issuers from Australia, China, India and Asean came in through the scheme. Notable issuers included Indonesian power producer PT Paiton Energy, which issued a US$2 billion dual-tranche project bond, and Chinese multinational corporation Haier Group, which launched a US$1 billion perpetual debt security. Overall, market observers acknowledge that results from the scheme have been encouraging, and while there are external headwinds, the corporate debt market in Singapore is poised for growth as market conditions stabilise. Clifford Lee, head of fixed income at DBS, said the scheme works, and continues to be a draw for issuers to come to Singapore. Essentially, this helps to "showcase Singapore as a financial centre with structural capabilities, boasts of a deep swap market that allows investors to hedge against risks associated with bond issues, and shows that our regulatory environment is robust", he said. He added that while last year was a stellar year for the Singapore debt market, headwinds could hail from various sources this year - the global trade war, an emerging-markets sellout sparked by Turkey, or corporate credit concerns from China. That said, Mr Lee suggested that concerns about China are simmering down, thanks to regulatory measures taken by the Chinese government. And with the summer holidays ending and investors returning, the markets are still very much liquid, with ample investible funds, he said. He added that issuance interest in Asian bonds is still lively, and that with better clarity in the market, demand for corporate debt may even outstrip supply. Sean Henderson, HSBC's co-head of debt capital markets in the Asia-Pacific, noted that several deals led by the bank would not ordinarily have been listed in Singapore, if not for the Asian Bond Grant Scheme. He said: "The strong investor reception and ease of partnership with the Singapore Exchange will certainly be encouraging for future issuers deciding on their venue of listing." However, he noted 2018's volatility due to geopolitical tensions and interest rate trends, which have resulted in a 25 per cent decline in year-to-date issuance volume for Singapore dollar (SGD) bonds. He said the "lack of bond supply in SGD thus far, coupled with the large redemption volumes in 2018, has resulted in a scarcity of bond investments for investors keen to put their money to work". "Given the stabilising market conditions, we now expect a flurry of issuances from corporates that have previously held off on their funding plans." Mr Henderson said it is important to note that the SGD bond market remains a critical part of the capital structure for Singapore's blue chip issuers such as Mapletree and OCBC, as well as quasi-sovereign issuers such as the Housing Development Board and the Land Transport Authority. Separately, MAS' report showed that total debt issuance in Singapore rose 39 per cent to S$259 billion in 2017, up from S$186 billion in 2016. This growth was underpinned by the increased issuances of both SGD and non-SGD denominated debt securities, which rose by 30 per cent and 40 per cent respectively. 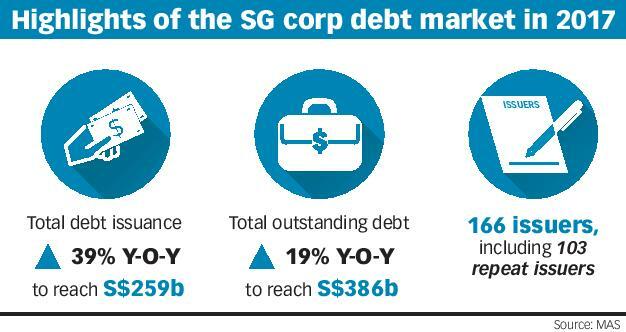 SGD debt securities issued hit a five-year high of S$27 billion, thanks to strong investor sentiment and issuers seeking longer-term funding ahead of the expected rate increases, MAS said. Singapore's debt market also continued to support issuers' funding needs in foreign currencies, with companies raising funding in multiple currencies. Non-SGD debt issuance accounted for 89.4 per cent of total debt issuances last year, broadly in line with 2016. Repeat issuances drove issuance volumes, contributing well over 80 per cent of total issuance volumes in 2017. The number of repeat issuers rose to 103 in 2017, from 85 in 2016. The MAS launched the Asian Bond Grant Scheme to encourage the maiden issuance of bonds by Asian companies in Singapore. The scheme supports up to half of typical issuance-related expenses, capped at S$400,000 for rated issuances and S$200,000 for unrated ones.